The camera’s the new keyboard. Scan & ShopTM, super-sonic Image Recognition and Visual Search for retail. Syndeca’s image recognition and visual search technology “Scan & Shop” lets your consumers shop what they see simply by pointing their camera. Customers can snap a picture of something they love (3-D objects), catalogs, advertising, look books, circulars, coupons — and get an instant path to purchase. Drive customers from physical to digital in less than a second. With direct matching, barcode scanning and visually similar search in a single scanner — your customers get instant, accurate results. Syndeca’s visual search technology not only provides customers with a link to a PDP, but also serves up rich, relevant results including multiple products (shop the look), videos, reviews, external links and more. Syndeca’s technology takes the guesswork out of matching products and items on the page. Fast, accurate results delight customers and drive purchase and improve customer satisfaction. 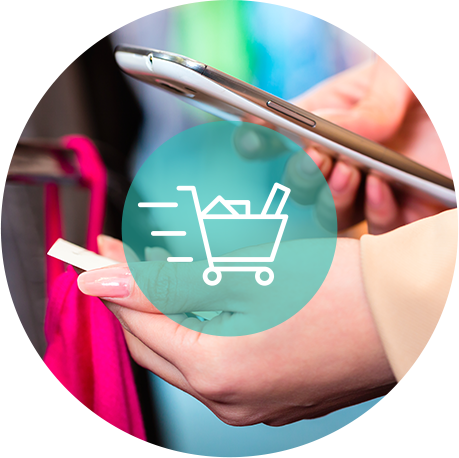 In fact, Scan & Shop users engage with the feature nearly 5 times per session and spend over 300% than typical app users. Our easy to implement SDKs and enterprise support allow your team to implement Scan & Shop in your existing apps in a matter of hours. To enable shopping, Syndeca Platform offers seamless plug and play integrations with virtually every ecommerce platform including Demandware, Hybris, Magento, ATG and more. We've put together a free guide and checklist to help you and your team evaluate solutions for Mobile Image Search. Get started developing your strategy today!